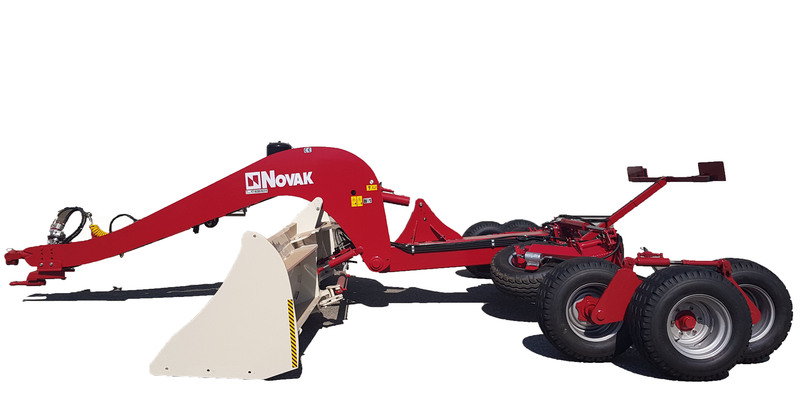 The MASTER leveller, available in three working widths (5, 6, 7 meters), is the top of the NOVAK range. A super-equipped machine, ideal for agriculture and earthmoving, for medium and large areas. With MASTER you save time by leveling quickly and with great precision thanks to the 1 meter high blade. With the use of special steels, MASTER and all NOVAK levellers are light, robust and fast. MASTER – 50 is supplied as standard with a hydraulic opening telescopic axle, thanks to which the working track widens to improve stability and work precision. The MASTER – 60 and 70 have the butterfly axle and two three-wheel balancer in the standard equipment; the variable working width together with the three wheels ensures a speed, in the finishing phase, of 10 – 12 km / h in order to complete the job quickly while maintaining the stable leveller. Among the options applicable to the MASTER levellers there is the pantograph axle which ensures even more speed in the execution of the work as well as maximum precision and stability. Closure of the blade towards the back of the machine: two machines in one! Download your presentation here to discover all the advantages of having a MASTER NOVAK leveller.